On December 13th, we hosted a Little Mermaid-themed birthday party for Ava and her cousin Annissa, both of whom turned two this month. 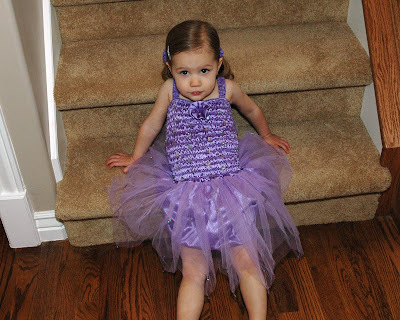 Here's Ava in her mermaid dress anxiously waiting for the party to get started. Soon everyone arrived and the festivities began as we gathered "under the sea" (i.e. in the basement). 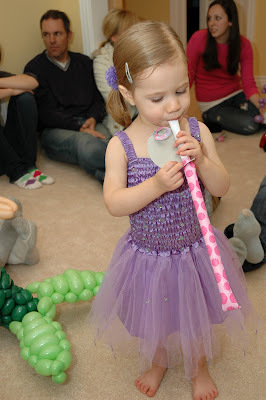 Ava was quite entertained by the party favors. The main event of the party was a show performed by The Balloon Guy. 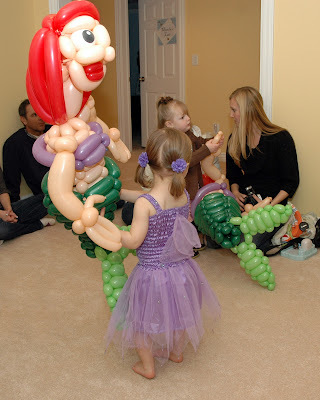 Prior to the party, he made two life-size Little Mermaid balloon sculptures for the birthday girls. Ava (who loves anything having to do with Ariel) was absolutely ecstatic. 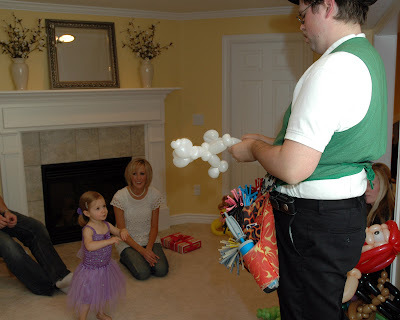 Here's The Balloon Guy in action twisting a balloon puppy for Ava. This is a slide show of everyone with their balloon character. Once everyone had their own balloon character, we opened presents. 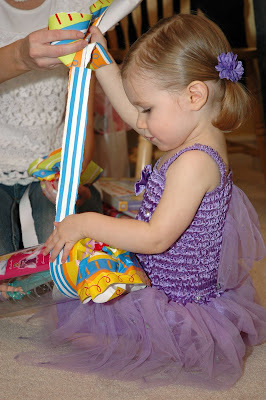 Here's Ava opening a Little Mermaid doll. Very appropriate considering the theme and all. Annissa was quite excited about this present. Wow! We concluded by heading up to the kitchen for mermaid cake and fish-shaped cookies. Thanks to everyone who celebrated Ava and Annissa's birthdays. They both had a great time. That is pretty cute!! Ava is adorable in her little mermaid dress!! Looks like it was a fun time...and I can't believe how big she is!! We'll have to plan a time next week to get together again!! Boo, fab cookies, those are super hard to make! I loved the balloon man, I hope he can come to my birthday! It looks like such a fun party. My boys had a great time and carried their Woody and Buz ballons. around until they popped/or deflated. 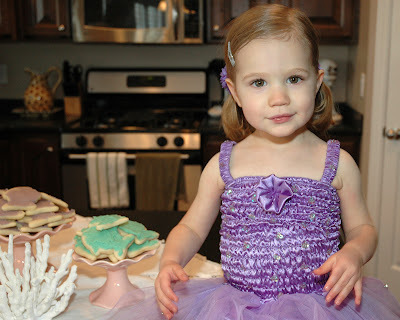 Ava looks so fab in her mermaid suit! Those cookies look yummy---I'm sad I missed all the festivities!